Gustave Caillebotte: Impressions Of A Changing Paris Impressionist paintings of Paris often depict a city full of sun-dappled socialites: dancing, shopping, boating and schmoozing. 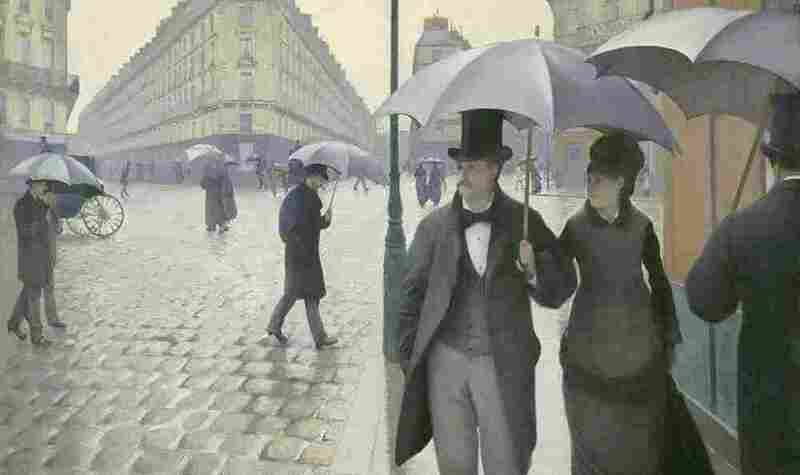 But for painter and patron Gustave Caillebotte, Paris was a darker, lonelier place. In the 1870s, an emperor and a baron undertook the remaking of Paris: Napoleon III and Baron Georges-Eugene Haussmann's urban renewal project converted clusters of medieval warrens into the Paris we know today, with its grand boulevards and rows of handsome buildings. Impressionist painters showed that new Paris on their canvases — but one of them had a very different perspective. 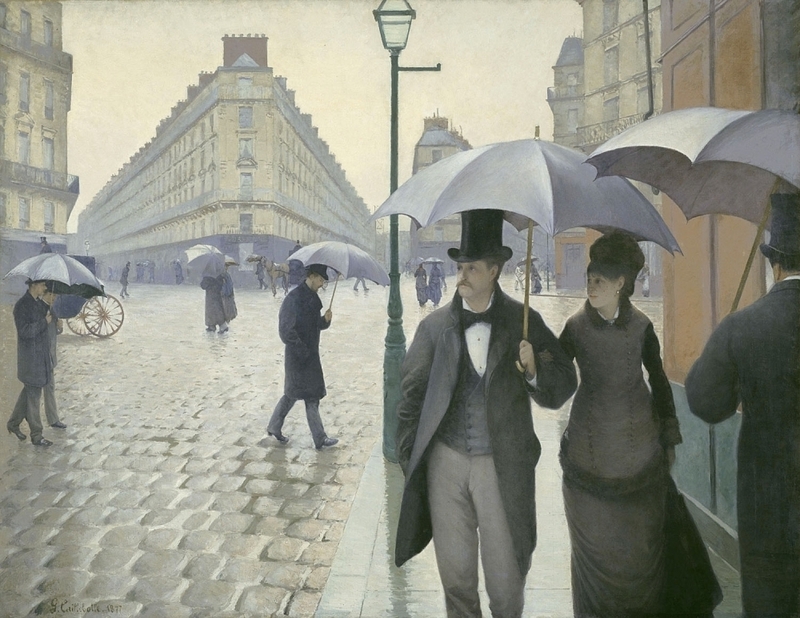 Gustave Caillebotte's best-known work, Paris Street: Rainy Day (above), painted in 1877, shows a vast cobblestone street, stretching out in front of looming, wedge-shaped buildings. The street is dotted with dark umbrellas that shelter top-hatted men, and women in long skirts — all looking vague and a little disoriented. That was a major subject of Caillebotte's: What the modernization of Paris was doing to its people. Many of Caillebotte's paintings depict the modernization of Paris. In his 1876 painting, Le Pont de l'Europe, pedestrians on a new bridge are engulfed by steel girders. The Jacquemart-Andre Museum, which is featuring an exhibition of Caillebotte's work, is located on Boulevard Haussmann — a broad and busy thoroughfare where, in the 1870s, wealthy Parisians built their mansions. (The museum was once the home of banker Edouard Andre and his wife, Nelie Jacquemart.) Caillebotte lived just down the street, and painted what was happening to Paris when Baron Haussmann was remaking it. 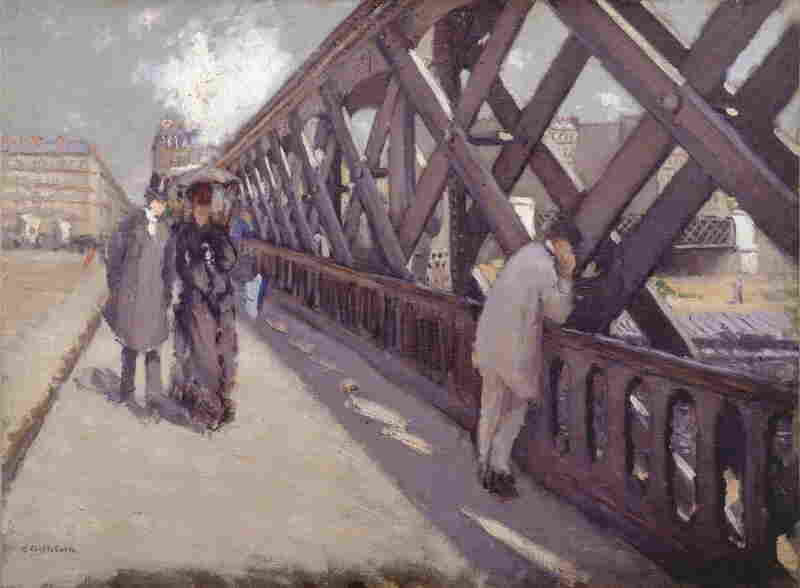 In Caillebotte's paintings, men leaning on new bridges seem engulfed by steel girders. Others stand on balconies, looking down at the Boulevard Haussmann — above, yet somehow dwarfed by, the street. 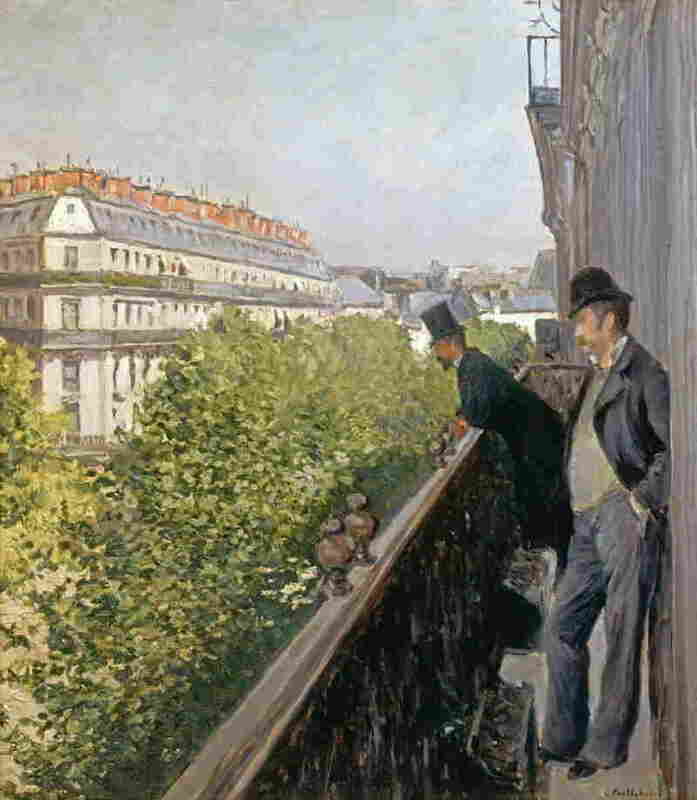 In Caillebotte's 1880 work, Un Balcon, two men gaze down at Boulevard Haussmann below, yet still appear dwarfed by the street. Caillebotte's contemporaries — Renoir, Monet, Sisley, Pissaro — also put this "modern" Paris in their paintings. But theirs is a Paris peopled by happy dancers, or sociable boaters, or busy shoppers, or flag-waving parade marchers. "They just wanted to show pleasant persons or fun activities," Garnot says, "not the kind of loneliness that you find [in Caillebotte.]" It's Caillebotte's perspectives — his wide-angled, panoramic views — that shade the paintings with sadness. The zooming angles and thrusting spaces are daring, compelling, dramatic and totally original. Not himself an Impressionist, Caillebotte loved what those painters and others were doing. He befriended them — Manet, Monet, Renoir, Sisley, Pissaro and Cezanne — at local cafes. Garnot says Manet had the habit of receiving friends at the Cafe Guerbois. Caillebotte decided to do the same thing — hosting the artists once a week. Caillebotte didn't just wine and dine his artist friends — he loaned them money (in fact, he paid the rent on Monet's studio for a while.) And most importantly, he bought their paintings for top dollar. Caillebotte was very wealthy; his father had made a fortune supplying Napoleon's army with uniforms, bedding and other materials. Gustave inherited that fortune at age 26. "He wanted to help the Impressionist painters," Garnot says. "So he purchased about 64 paintings from Monet, Renoir, Sisley, Pissaro and all the others." Caillebotte purchased Renoir's Dance at Le moulin de la Galette and many other Impressionist works long before they were popular. Works in his collection by the likes of Monet, Renoir, Pissarro and more would one day be recognized among the world's greatest Impressionist works. 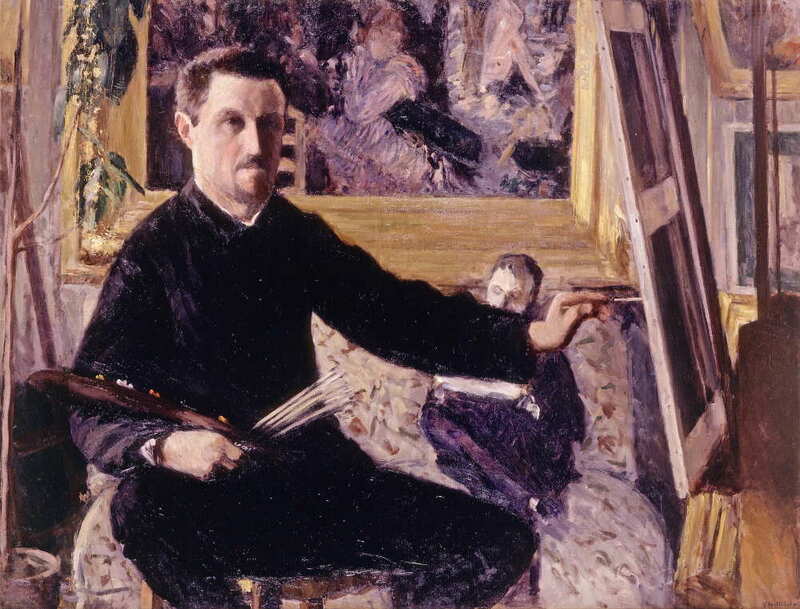 One of the paintings in the Jacquemart-Andre show is a self-portrait Caillebotte made early in his painting life. He started painting relatively late, at age 27, and only lived to 45. In this 1879 self-portrait, he's 31 years old and seated at an easel in his apartment. Behind him on the wall hangs a painting that is now considered one of the greatest Impressionist works. It's Renoir's 1876 Dance at Le moulin de la Galette. 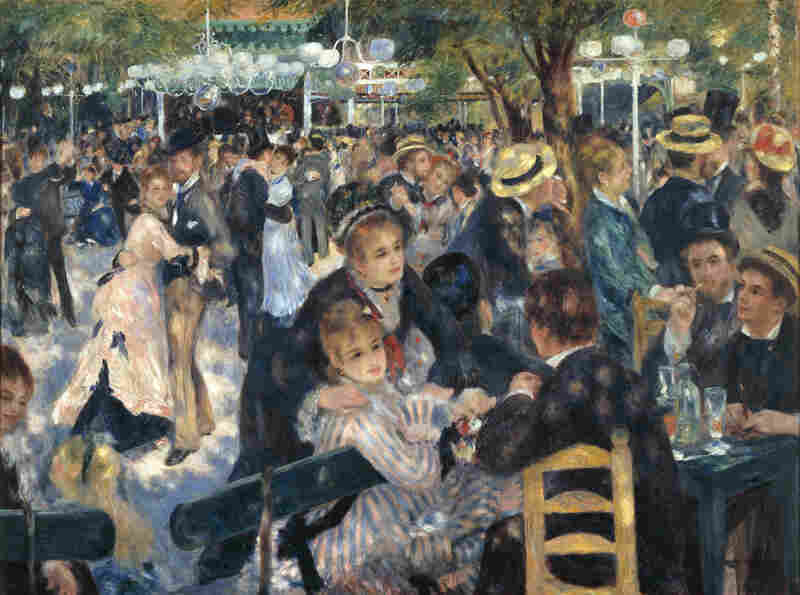 Renoir shows a sun-dappled crowd of convivial partiers, dancing, drinking and schmoozing. Caillebotte was the first owner of this Renoir masterpiece, and reproduced it in his own self-portrait — as a salute. He was a nervy painter, but not a professional one — and he didn't really have to be. Caillebotte had loads of money and didn't need to make his living from art. The 500 or so paintings he created stayed in his family. In part, that's why he's less well-known than his great painter pals. Caillebotte's pictures weren't in museum collections, and he didn't get serious attention until the 1960s. But because he was a great patron of the arts, Caillebotte's first-rate art collection became what today is the crux of the Impressionist holdings at the Musee d'Orsay in Paris. Although for a while, he (or his executors) couldn't even give the paintings away. "It's a pity," Garnot says. "When he offered all [of] the collection to the French state, the minister of fine arts wasn't pleased at all by the donation. He refused it. He turned them away." At the time, the custom was for the state to only accept works by dead painters. But that wasn't the only reason the paintings were rejected by the state: "You must understand," Garnot says, "that they didn't appreciate ... the style." Critics of the day felt the Impressionist works looked hasty, crude and unfinished. There was no place for them in prestigious, official French collections. Caillebotte died in 1894. Seven years later, after much bickering, wrangling and negotiation, 40 of the 60 paintings in his bequest of Impressionist treasures were accepted by the government of France. Now, more than a century later, the names Renoir, Monet, Sisley — and, yes, Gustave Caillebotte — have become part of the Pantheon of French painting.